McCourt’s project to rehabilitate runway 4R-22L and reconstruct the light pier at this runway is in its final stages. 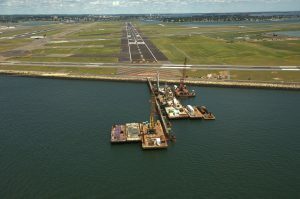 The runway was reopened on schedule and the light pier construction is proceeding apace – all drilled shafts have been completed and pier cap & deck planks are being installed. The completion of the pier is set for the end of August.